The Silent Auction was such a success last year at the Carnival that it is coming back even bigger and better! 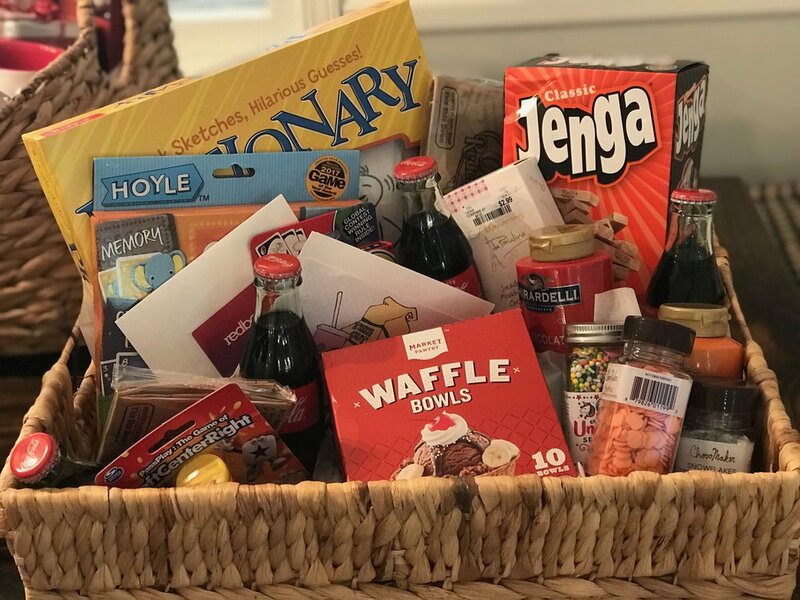 In addition to our administration-sponsored items and class-sponsored gift baskets, we are requesting donations from our Bobcat families, friends, and local businesses. Check out our full item listing below! Perone's Kitchen makes their small batch, old world style marinara sauces using only natural, top quality ingredients. 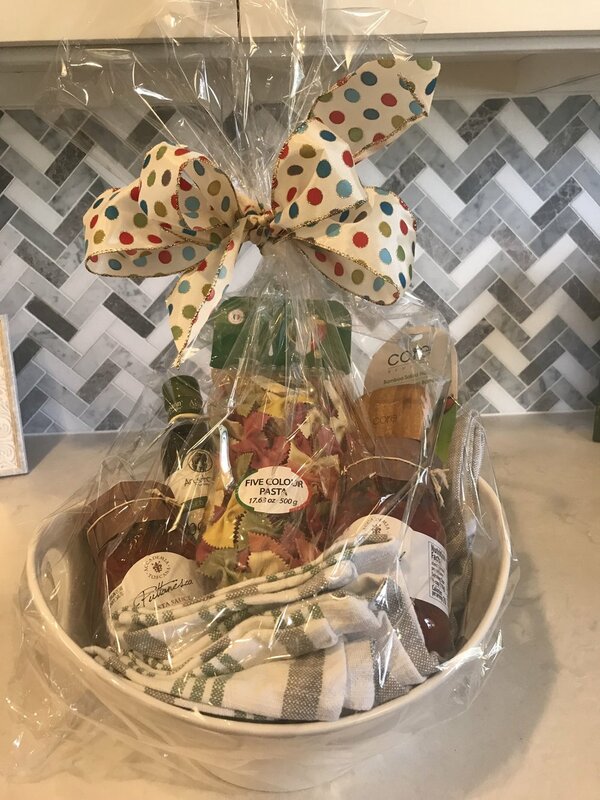 This gift basket includes Perone's Basil Marinara sauce, Roasted Garlic & Mushroom sauce, italian seasoning and organic italian pasta. Buon Appetito! From California’s first premium winery, Buena Vista, this 2015 Jovita’s Selection Chardonnay opens with a bouquet of citrus and tropical fruit with a hint of vanilla. Enjoy it in these "Cheers" Go Vino stemless wine glasses. Take home stylish seasonal home décor from AR Workshop. Then plan a date with friends to sip your favorite drink and have fun letting your inner craftinista shine with a $50 gift certificate to attend a workshop where you can make your own. With over 30 years in the industry, Linda Perone has mastered the art of "making your house feel like a home." This gift certificate is worth one-hour of decorating with Ms. Perone. Check out the items we’ve received so far! Name the Carpool Line or Back Path! Have your own customized street sign installed in the car line upfront or back path in back for the entire school year. Pick your own street name, like "Wendy's Way or Penny's Path". Two separate winners. 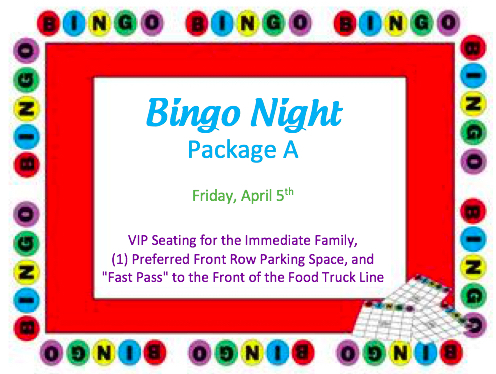 VIP seating (at a front row table) for the immediate family, (1) preferred front row parking space, and a "Fast Pass" to the front of the food truck line at Bingo on Friday, April 5th. 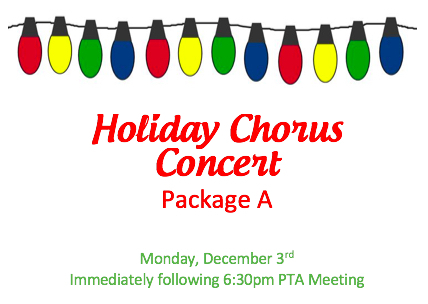 Reserved seating for (4) and (2) preferred parking spaces at the Holiday Chorus Concert to follow the General PTA Membership Meeting on Monday, December 3rd at 6:30pm. Don't miss the The Palmetto Bowl annual rivalry game between Clemson's Tigers and USC's Gamecocks on November 24, 2018. You can't beat these (2) 40-yard-line tickets on the Clemson Home Side (South Stands, Lower Level, Section E, approx. 30 rows up). *Parking pass is NOT included. 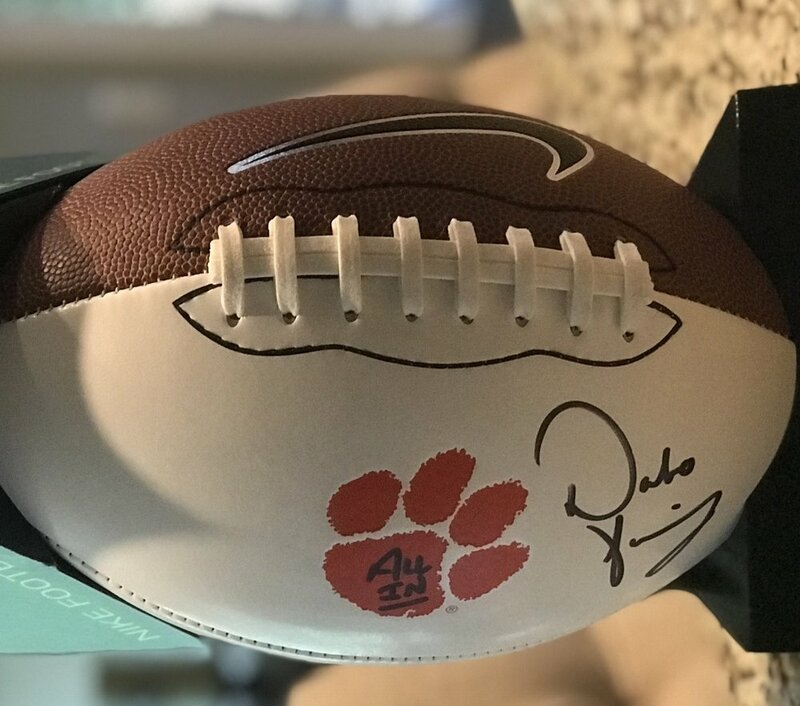 Add this full-size football autographed by Clemson’s football coach, Dabo Swinney, to your collection of memorabilia. 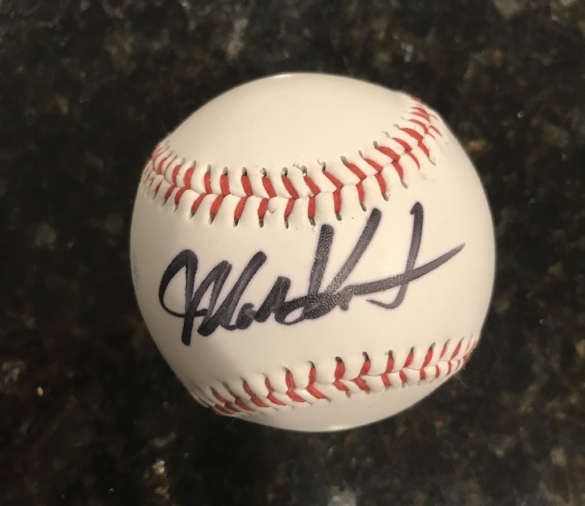 Add this autographed baseball signed by University of South Carolina Head Coach Mark Kingston to your collection of memorabilia. Orangetheory's fitness instructors provide inspiration and guidance through your workout and bring results based on your needs. Try it out with this 3-pack voucher good for a total of 3 workouts at the same studio, workout towel, water bottle, and stress ball all in a drawstring bag. 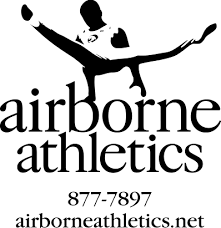 Gift certificate good for one free month of gymnastics or tumbling classes at Airborne Athletics. Includes one class per week for four weeks. 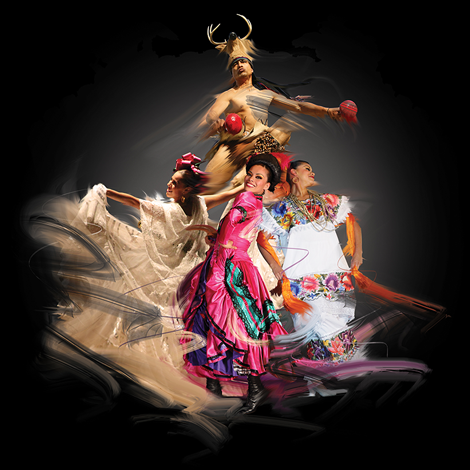 This family friendly ballet fuses spirited music, dance, and breathtaking costumes of Mexican folklore from pre-Colombian civilizations through the modern era. This package includes (2) tickets in the Orchestra Section, Row J for Thursday, November 15 at 7:30pm. Click HERE for more info. Drive around town in style for a weekend with this BMW experience. Choose an X3, X5, or X6, depending on availability, for a weekend of fun. Pick up is after 12:00 noon on Friday and returned anytime Sunday evening or before 9:00 AM Monday morning. Vehicle must be picked up and returned to BMW Manufacturing Co. in Greer, SC. *Please redeem within one year of receipt. You're never too young to learn to play tennis! This basket includes (2) private one-hour lessons, junior clinic package, a massage, T-shirt, and a set of balls. Southern Living readers voted Charleston the #1 city in the US and Canada. Decide for yourself and enjoy some of these great activities while you're there! 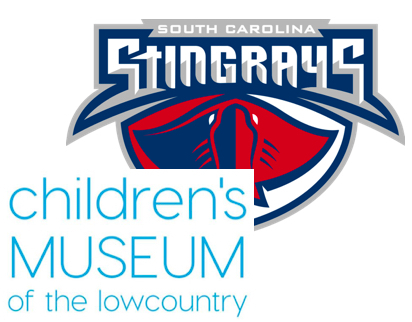 Included is a Family Day Pass to the Children's Museum of the Lowcountry and (4) Ends Section tickets to a 2018-19 SC Stingrays Hockey home game. Check out the best barre technique in this high-intensity, low-impact, total body workout at Pure Barre Greenville. Included is an intro month of (4) weeks of unlimited classes, tank top (size L), hair ties and specialty barre socks. Dollywood offers you the chance to immerse yourself in the natural beauty of the Smoky Mountains and the incredible spirit of its people, all at a place fun for all ages. Taste award-winning recipes, experience heart-pounding thrills and witness incredible performances sure to become memories you'll treasure always with these (2) tickets for admission. Expire 1/1/2020. One of America's best zoos is right here in our own state! Use these (4) complimentary passes to visit Riverbanks Zoo and Garden in Columbia, home to more than 2000 animals and one of the nation's most inspiring botanical gardens. Located in the heart of downtown Chattanooga, just steps away from the Tennessee Aquarium, Tennessee Riverfront and other fun Chattanooga Attractions for kids. 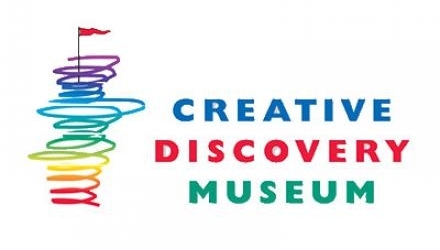 Take a weekend trip to Tennessee and enjoy these (4) complimentary tickets to one of the top children's museums in the country. Expire 7/20/19. This toy box is made from a 100-year-old red oak tree that was recently removed from land at the Greenville Spartanburg Airport to make room for the new runway. Stained in the color “gun stock” with dimensions 37 x 19.5 x 18, this timeless, one-of-a-kind piece includes hardware and a lid with a chalkboard insert, If you do not want to use it as a toy box, it would make a great hope chest or coffee table. Will include a few toys, as well. DONOR: Keith Smith of Keith Smith Builders, Inc.
"Setting Out" is sure to capture your eye and look beautiful in your space. This 12x12 oil painting on canvas is framed in a light wood floater frame. For more info on Janina and her work, click HERE. This beautiful 14x17 weathered-wood framed acrylic on canvas landscape painting is sure to compliment any home. 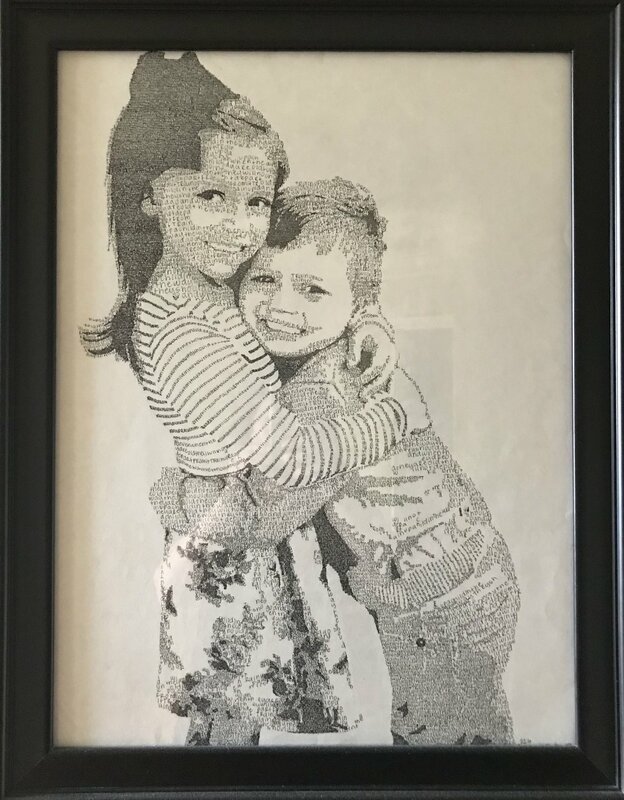 Capture cherished memories in this 18x24 unframed, black ink custom drawing. Done in the repeated print of a song lyric or bible verse of your choosing from a photograph of up to two children. You may add more family members for an additional fee. Capture your beautiful home in art with this 8x10 unframed, black ink drawing on stiff bristol board paper. You provide the photos of the home to be drawn. Decorate your home with this framed 8x10 print of a charcoal drawing of the iconic Greenville landmark - Liberty Bridge. Decorate your home with this framed 8x10 print of a charcoal drawing of the iconic Greenville landmark - Reedy River. 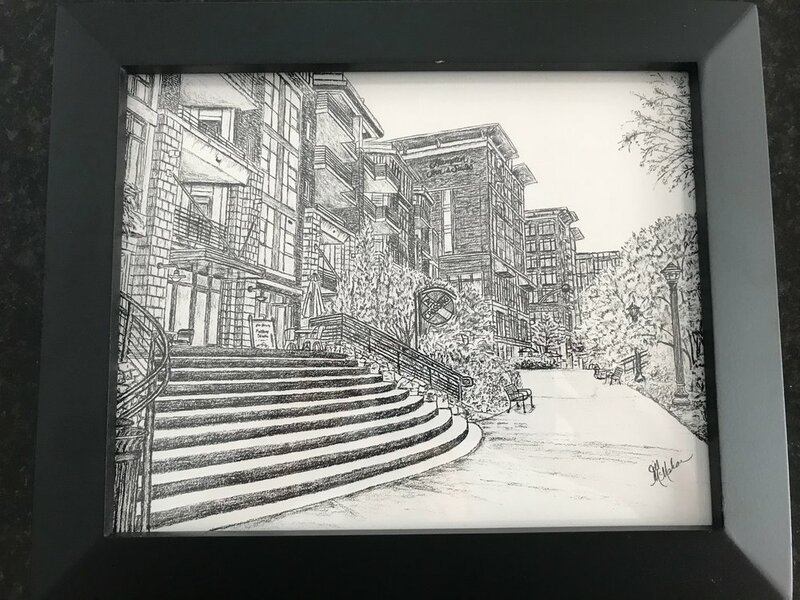 Decorate your home with this framed 8x10 print of a charcoal drawing of the iconic Greenville landmark - Art Crossing. 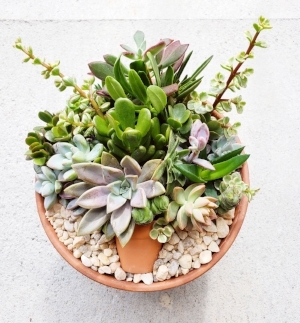 Add this beautiful succulent arrangement to your house plant décor. Variety of 12 different succulents in an 8" terra cotta pot. Animal lovers will adore this 25x11 weathered-wood framed acrylic on canvas painting of a labrador with his bird friends. Animal lovers will adore this 22x11 stuffed pillow with an acrylic on canvas painting of a labrador with his bird friends. Turn yard work into a breeze with this basket that includes a $100 gift certificate to Aiken Brothers of the Upstate, as well as (2) fuel stabilizers and engine oil for your lawnmower, (2) oil mixes for 2-cycle engines, trimmer line, chainsaw bar oil, carburetor cleaner, engine starter fluid, pruning shears and loppers. Enjoy a delicious pasta dinner with your family! Included in this large ceramic bowl are 3 dish towels, five color pasta, (2) pasta sauces, infused olive oil, and bamboo serving spoons. You are sure to be in style with this large burlap handbag. To be monogrammed with your choice of monogram style and color after the Carnival. Serve up fall in style with this basket of goodies, all while wearing the included gorgeous Silver necklace & earring set. Other fun items are a Nora Fleming serving piece, 2 "minis" and minis holder, Bonjour Y'all cookbook, engraved wood cutting board, Gullah Gourmet Gumbo mix, 3 Tea Towels, and a Bird & Acorn fall decor set. Do you like an affinity for all things BLUE and don't show away from making a statement? Then one of these Southern Tide baskets are for you! Included are Southern Tide beach towel, trucker hat, Yeti 30oz Rambler, can caddie, sunglass strap and Skipjack foam mitt. Capture beautiful memories with a family session by Photographer Paige Ellett. Includes sitting fee and digital gallery of edited images. No expiration date. Includes 25 party invitations, thank you cards, address labels and goodie bag tags from any design offered on www.amyadele.com. This GELeration Manicure is the most sophisticated soak-off Gel manicure. GELeration not only is gentle on the nail with 3 to 4 weeks of “everlasting” color. There is no chipping, fading or smudging and nails stay flawless! Immerse your feet in this aromatic whirlpool bath pedicure, including a glycolic callus softener and revitalizing foot mask applied to soften and smooth the skin. End the pampering with a relaxation foot and leg massage. This 60-minute Swedish massage uses firm but gentle pressure to improve the circulation, ease muscle aches and tension, improve flexibility and create relaxation.The therapist uses massage oil to facilitate making long, smooth strokes over the body. This deep pore cleansing facial consists of exfoliation, steaming, extraction and cleansing of clogged pores to melt away surface impurities. Your face, neck and décolleté will be soothed by massage followed by a personalized repair mask selected for your skin type. Your girls will be in fantasy heaven with this adorable storage box full of toys. Included are LEGO Friends sets, an ombre water bottle, LOL doll, fairy-themed items, Mad Matter Dough, blanket and unicorn plush, pencil case with fun accessories, Fingerlings puzzle, and the sought after Donut Squishy. Your boys will go bonkers for this basket full of toys. 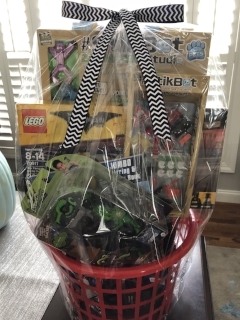 Included are a Darth Vader mask, LEGO Batman set, StikBots, Avengers and Transformers-themed items, a stunt car, and the super popular Fingerlings T-Rex. 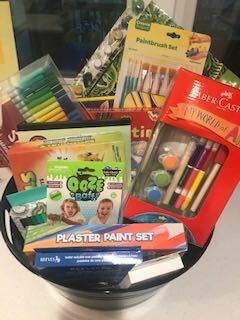 Your resident artist can be creative for days with this basket full of crafts. Included are plaster and paint sets, pencils, markers and pastels, slime bath, crystal pets, and a Llama Lamp set. Snuggle up by the fire in this warm blanket and settle in for a fun family movie night. 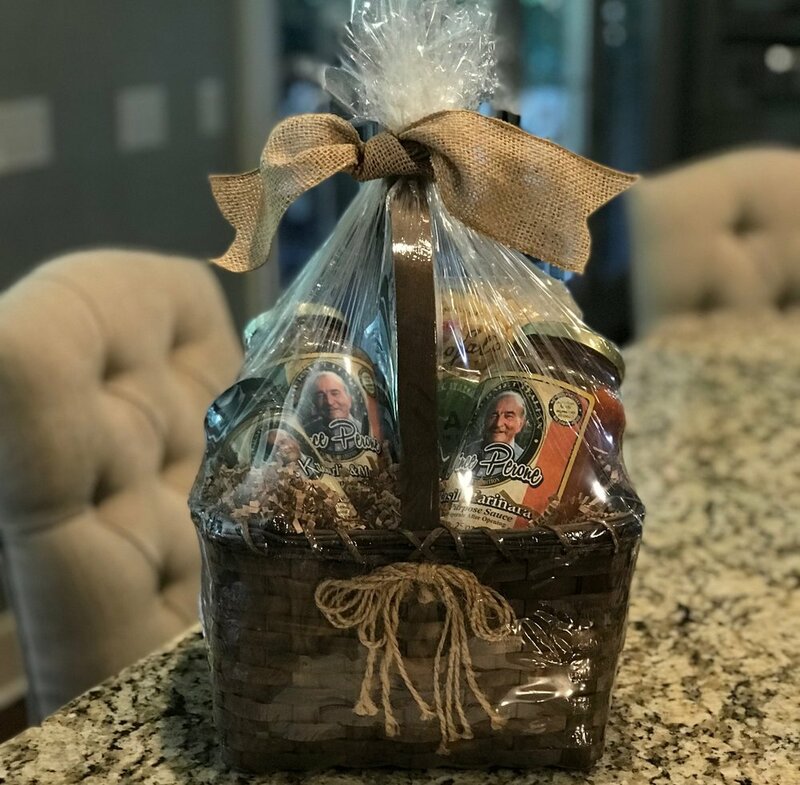 Included with the blanket are mugs and accessories for hot chocolate, popcorn, cookie mix and decorations, a candle and the movie "Polar Express". Get your GAME ON at Spare Time with the family. Included are $50 toward bowling and shoes, $30 toward Games, fun socks, Cokes and candy. Stay in with the family and order out for a fun night of games and a movie. 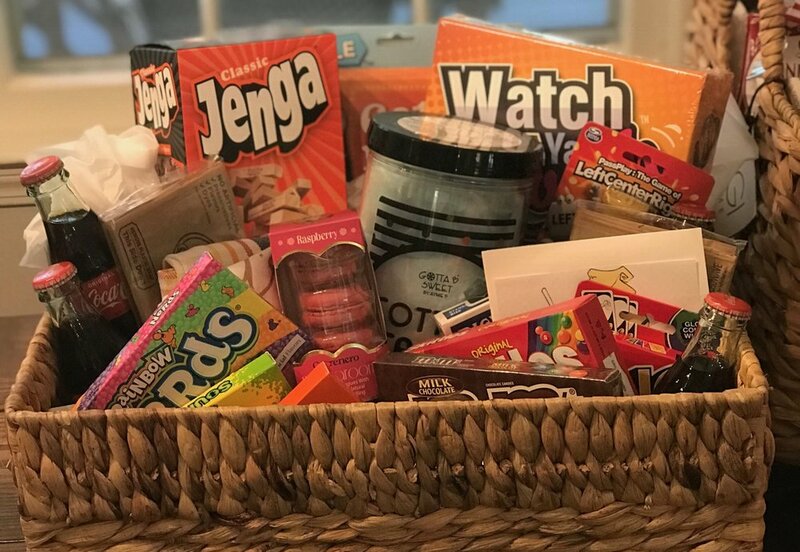 Included are $25 for takeout, Redbox gift card, Watch Ya Mouth, Jenga, 6-in-1 Cards, Left Right Center, Uno and a deck of cards, cotton candy, cookies, popcorn and other snacks. Stay in with the family and order out for a fun night of games and a movie. Included are $25 for takeout, Redbox gift card, Pictionary, Jenga, 6-in-1 Cards, Left Right Center, Uno and a deck of cards, fixin's for ice cream sundaes, popcorn and snacks. Take a break and spend Family Night out with dinner and a movie. Included are $45 dinner gift card, $45 Regal gift card and candy. Roast s'mores in style with this Landmann Firepit full of goodies! Included are $50 Cabela's gift card, S'mores Caddy, S'mores ingredients--Hershey bars, bag of marshmallows, box of graham crackers, 6 piece roasting forks and 12-pack Mystical Fire. Show your blood runs orange and purple with this ultimate Tiger tailgate collection. Included in this Clemson market tote are Clemson Door Hanger, Clemson ceramic dish, Clemson chip & dip, and Clemson tea towel. Show your blood runs garnet and black with this ultimate Gamecock tailgate collection. Included in this SC cooler are 2 plastic wine glasses, mason jar coaster set, picture frame, Gamecock tailgate sign, and Gamecock tea towel. Stay fit and looking great with this gym workout collection. 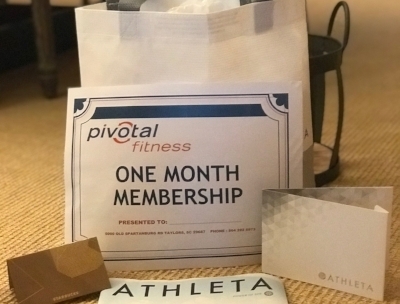 Included are one-month Pivotal membership, $50 Athleta gift card and $15 Starbucks gift card in an Athleta carry all bag. Stay fit and looking great without ever leaving your house! Included are $50 Athleta gift card, water bottle, yoga towel, fitness mini bands, and an ab wheel all inside this awesome Reebok gym bag. Spoil yourself with a little retail therapy followed by a spa day! Included are $50 Athleta gift card, $50 MG GRAND Day Spa Gift card, and a few loofahs and bath bombs. Pamper yourself in the comfort of your own home with this luxurious basket of goodies. Included are a cozy robe, make up/face wash headband, body scrub and lotion, coffee with mug and spoons, herbal tea, sparkling grape juice with stemless flute glasses, and Belgian chocolate pralines in a cute metal storage basket. Treat yourself to gorgeous nails with this sweet basket. Included are $40 manicure at Lovely Nails Salon, (2) Opi Nail Colors, Pedi and Mani in a box for home use and a $15 Starbucks gift card. So many parties! So many gifts! Nothing to wrap them in? You need this gift wrapping essentials basket. Complete with wrapping paper, gift bags, colorful tissue paper, cards, stickers, colorful pens, ribbon, scissors, and tape. All assembled together in this great Thirty-One Large Utility Tote. Never have the right wrapping paper for the occasion? No worries with this all occasion gift wrap basket. Includes birthday, wedding, baby and holiday paper and gift bags, colored tissue paper and bows, clear cello, scissors and tape in a large canvas tote. The holidays are busy enough. Having to find the right wrapping for each present makes it even harder. This basket Includes Christmas decorations and ornaments, Santa's List paper, holiday frame, handprint kit, Hanukkah cookie cutters, mini Menorah, and plenty of wrapping paper and ribbon. No expense left unnoticed in this Parents' Night Out basket! Enjoy $50 for dinner or drinks at Bar Louie, $25 for a movie at Regal, $20 towards a babysitter, and a bottle of Sparkling Red Grape Juice (non-alcoholic) to enjoy with Ferrero-Rocher Chocolates for dessert. No expense left unnoticed in this Parents' Night Out basket! Enjoy $50 for dinner or drinks at Rick Erwin's, $20 Golden Ticket to Alchemy Comedy (at Coffee Underground) for 2, $20 towards a babysitter, and a bottle of Sparkling Red Grape Juice (non-alcoholic) to enjoy with Ferrero-Rocher Chocolates for dessert. No expense left unnoticed in this Parents' Night Out basket! Enjoy $25 for dinner or drinks at Stella's Southern Bistro, $20 towards a babysitter, and a bottle of Sparkling Red Grape Juice (non-alcoholic) to enjoy with Ferrero-Rocher Chocolates for dessert. No expense left unnoticed in this Parents' Night Out basket! Enjoy $25 for dinner or drinks at Ruth's Chris Steak House, $50 for fun at Spare Time for bowling or games, $20 towards a babysitter, and a bottle of Sparkling Red Grape Juice (non-alcoholic) to enjoy with Ferrero-Rocher Chocolates for dessert.